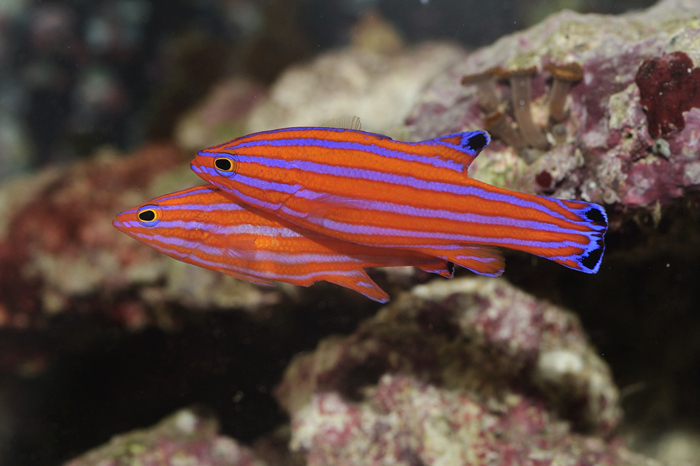 The Candy Basslet is one of the most brightly and beautifully colored fish. With a max size of about 2.5 inches and peaceful demeanor, these fish represent one of the most highly sought after reef fish. They are not easily collected so they command a high price. If you are lucky enough to own one of these specimens you will find quickly that they are hardy and have a lot of personality. They like hiding places and will swim within rock work and caves. They have been known to spawn regularly in an aquarium environment.